Physorg are reporting an exciting find of what are described as 30 ‘pebble culture’ lithic tools, dating back over 1.5 million years, at a site which has been dated argon dated to 1.57 million years old, thanks to an ancient volcanic eruption whose lava flow preserved the ancient ground surfaces. Although no human remains have been found, many associated fossilized mammal remains came to light at two locations 50 meters apart from one another, with the second producing the lithic assemblage, bearing signs of wear from use – prompting French archaeologists to claim the finds constitute some of the earliest stone tools known anywhere in Europe. After having being alerted by a local man in the Hérault Valley, Languedoc -Roussillon , who had found ancient teeth and bones in a basalt quarry some 15 years ago, the site was revisited, and another excavation begun nearby. A new vertebrate fauna associated with lithic artefacts from the Early Pleistocene of the Hérault Valley (southern France) dated around 1.57 Ma. 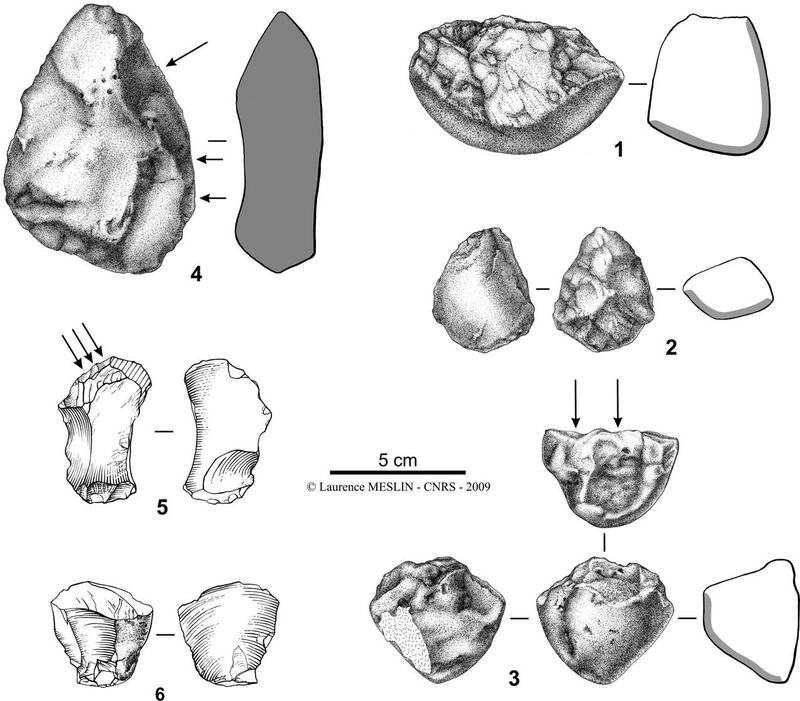 Some lithic artefacts associated with an Early Pleistocene (Upper Villafranchian) vertebrate fossil assemblage have been found from a quarry exploited for basalt in the lower Hérault Valley (Languedoc, southern France) at the Lézignan-le-Cèbe locality. A preliminary patrimony expertise led us to identify about 20 vertebrate taxa, and the autumnal rainfalls revealed the presence of roughly 30 lithic artefacts of “pebble culture” type. A basalt layer dated at 1.57 My directly overlies the fossiliferous level, extends along the little hill (locus 2) yielding artefacts. These new promising data offer new perspectives to improve our understanding of Early Pleistocene ecosystems (and possibly ancient hominin occupation) of southern Europe. Although the paper is behind a paywall, I found this ‘Article In Press’ (PDF) version, which has an abridged English text along the main body in French, about which I’ll add a few related notes. CO2 laser probe 39Ar-40Ar step-heating analyses were performed on whole rock single grains from 12 samples collected from four close areas on the lava flow covering the study site. All experiments displayed concordant plateau ages between 1.536±0.063 Ma and 1.627±0.136 Ma. As all inverse isochrone calculations yielded initial (36Ar/40Ar) ratios undistinguishable of the atmospheric ratio, excess argon can be ruled out. The weighted mean of isochrone ages, at 1.57±0.01 Ma (1), is in perfect agreement with the weighted mean of plateau ages at 1.56±0.02 Ma (1) and is probably the best estimate of the emplacement age of the lava flow. This age at 1.57±0.01 Ma (1) postdates the study site. Amongst the fossilised fauna, a wide range of mammal taxa were identified – Leptobos etruscus, a type of buffalo, Eucladoceros ctenoides vireti, an extinct bush antlered deer, Equus altidens, which I think is a species of zebra, Dicerorhinus etruscus etruscus, rhinocerous, Canis etruscus, a wolf species, Meles thorali which is described as a Eurasian badger, Homotherium crenatidens representing the sabre-toothed cat community, a type of hyena known as Pachycrocuta brevirostris, Prolagus sp. a small, rounded herbivore related to the modern pika, a rodent by the name of Microtus, cf. Allocricetus Apodemus, and Talpa fossilis, a species of mole, and Aves indet, which I take to mean unidentified birds. This faunal suite is said by the authors to correspond to that known for the Early Pleistocene in central France. The lithic assemblage includes 20 artefacts of pebbleculture type. The supports and striking platforms are quartzitic pebbles, large basaltic flakes and fragments, and smaller flint pebbles. All flakes are exclusively produced by direct percussion, employing a hard stone hammer. Unilateral alterations can be observed on the periphery of certain flakes. The pebbles are developed in chopping-tools, and their edges often show traces of repetitive impacts. The lithic assemblage found at the locus 2 shows similar primary technical features to those from the other Early Pleistocene European sites. The authors conclude by saying that much work still needs to be done – they state that the faunal remains recovered so far only offer a partial view of the contemporary suite, and although some of the fossils show damage from carnivores, others from Locus 1 appear to have been intentionally broken, quite possibly by those or similar choppers and chopping tools found at Locus 2 – the bones are still undergoing taphonomic analysis to determine whether such breakages were induced by humans, became damaged by carnivores or geologic processes. To put these 1.57 million year-old pebble tools in an overall context, the earliest known lithic assemblages anywhere date to c.2.5 million years, known as the Oldowan industry from Eastern Africa, whilst those found in Georgia at Dmanisi date to c.1.7 million years. The earliest known stone tools elsewhere in Europe are mainly from Spain, notably the sites of Atapuerca to the north near Burgos, about 1.2 mya, and Orce to the south in Andalusia. From the description given, the tools from Lézignan-la-Cébe appear to correspond to the Acheulean industry, and if they are defined as belonging to the chopper/chopping tool industry (apparently part of the overarching Acheulean), they’d have aspects in common with Asian lithic industries, dating to the Middle/Late Pleistocene. The oldest known stone tools anywhere in Europe, dating to an estimated 1.8 million years are described at Chilhac, Auvergne, also in modern day France. Work at the Lézignan-la-Cébe site is set to continue in 2010. Those Homo erectus certainly got around rapidly once they’d left Africa. Spread from Western Europe to Northeast Asia and even way down into SE Asia. I don’t think so. I thought hand-axes were diagnostic of Acheulean. No hand-axes evident in this assemblage. Hand-axes seem to be a more recent development and spread through just part of the H. erectus geographic range. Definately Olduwan tool technology not Acheulean. Looks like core tools, amorphous cores, expedient flake tool behavior. Same as Olduwan, or even older Lower Paleolithic stuff. “Definately Olduwan tool technology not Acheulean”. Thanks. I thought so. The Acheulean is an early example of a technology that failed to reach marginal areas of the contemporary human geographic distribution. Much the same as blade technology, microlithic technology and even the whole Upper Paleolithic. We’re standing on shakey ground when we associate specific technolgies with specific human species. dont agree more modern then oldowan. more shapes and more shaping, higher nr of flakes removed per pebble. ancient tho, well you can’t expect real oldowan in europe, and these froms immediatly follow that to persist for 100’s k’s of years.